Hey! YA and middle-grade readers, Beware! Cullen Bunn has come blasting out of the woods to deliver one of the most intense, adventurous, non-stop thrill rides you’re likely to experience in modern horror fiction for kids. Packed with enough punch to make seasoned horror fans shiver, Crooked Hills transcends the stereotypes of “the good guy always wins” kid lit., leaving you slavering for more and begging for the scares to stop so you can catch your breath. For Charlie and his brother Alex, an unexpected trip to visit their Aunt Mary in the haunted town of Crooked Hills turns into a life-changing adventure, forcing them to confront local bullies, hell hounds, dead witches, and girls with slingshots! 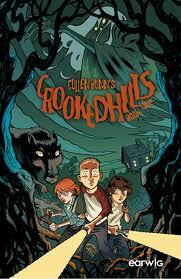 A throwback to classic adventures like that of the Hardy Boys, mixed with the creepiness of GOOSEBUMPS and CIRQUE DU FREAK, Cullen Bunn’s CROOKED HILLS blends mystery and adventure to weave a fun and unforgettable story of will, friendship and family bonds. With Crooked Hills, Bunn, a well established and celebrated author of comics, novellas and novels like The Damned, The Sixth Gun, Blood Feud, etc., eschews his more adult themed work, taking a turn at writing for younger audiences for a spell, and doing so phenomenally! It’s been a long time since we’ve read something this great, and can honestly say that the whole feel is akin to a novel length journey back in time to the Scary Stories To Tell In The Dark by Alvin Schwartz and Stephen Gammell era (a favorite in the DT camp). And seriously… that’s saying a lot. Not only does Crooked Hills deliver on the scares, but it’s also a brilliantly paced and plotted trip into the backwoods, feeling like one of those good, old fashioned yarns that can be told for years to come. From the first page, Bunn interacts brilliantly with his audience introducing a great new car game and what will probably become an inside joke for readers young and old. “I BURY ALL YOUR COWS!” will go down in the DT offices as a go-to one liner, that’s for sure. Bunn’s ability to stay close to the middle-grade style of quick description and short sentence structure is a plus that ultimately drives every nuance of the tale home in a very direct and efficient manner. Despite the age appropriate prose, Bunn’s narrative can be deceiving. Adult readers are sure to forget this is a YA novel as they get lost in the Crooked Hills world. One of the best aspects of this novel is the pacing. This book will entertain both young and old audiences. Young readers will abandon their iPods, iPads, or whatever other digital contraption kids are into these days to follow brothers Charlie and Alex on a Hardy Boys-inspired mystery. For the adults of our generation (we’re all around 30! ), this will harken back to a time of road trips, creepy woods, and childhood detective work. This story will be especially nostalgic for those who grew up loving the mystery and sci-fi tales and they may see a part of their younger selves in our thrill-seeking protagonists. There’s no doubt Bunn was a little monster kid himself and his inspired characters make this a charming tale that will keep a wide range of readership engaged. Note from Colum – Though the book is brilliantly fashioned and delivers top notch quality scare after scare, I would, as a father of 3 young kids, caution readers to give this book to the appropriate age group (around 9 and up). Before reading, I mistakenly promised my 6 year old daughter that she could read and review this piece with me, only to find myself profoundly creeped out by a few instances in the book, and realizing that she is definitely too young for it. That said, I will make this novel mandatory reading for all of my children, but only when they’re ready for the subject matter at hand. Some of it does get a little intense. Bunn really delivers a fantastic story with Crooked Hills. We’re all very excited by the fact that this is only the first in the series and eagerly await the next. Bunn has delivered a spine-tingling tale that will surely go down as one of the greatest scary stories for kids in the years to come. We’re glad that the gateway to horror fandom is being manned by this author as he has surely proven himself worthy. Bunn shows in Crooked Hills that he can deliver a spooky story that will inspire budding horror fans and appease the adult genre lover at the same time.